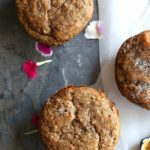 Extra crispy vegan & gluten free sugar cookies made with warm coconut oil and baked to crunchy perfection! Turn this easy gluten-free cookie recipe into cut outs, decorate with royal icing, dip in chocolate or serve plain! Guilt-free and low fat is how we can refer to these delicious gluten free sugar cookies! Are you sick of all the sugar cookie recipes on the blog yet? So far this blog has lots of different versions which are all incredibly tasty! We have grain-free vegan sugar cookies, healthy beet gluten-free sugar cookies, and healthy Christmas gluten-free sugar cookies colored with spinach for any one with a food allergy or trying to cut out carbohydrates. We have Greek yogurt sugar cookies for anyone wanting to add a little more protein and less fat to desserts. 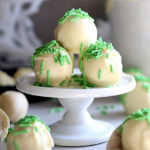 We have vegan sugar cookie truffles (lets face it, who doesn’t love a cookie wrapped in chocolate)! 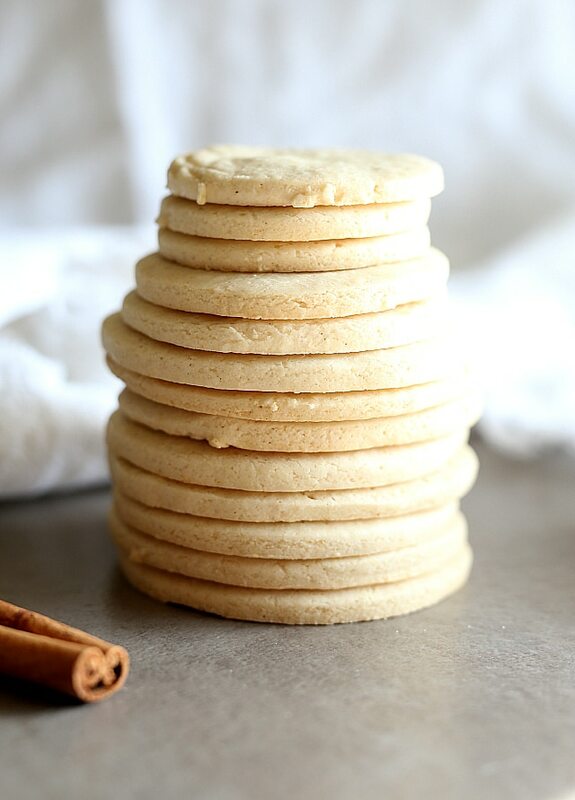 Today we have gluten free vegan sugar cookies that are lower in fat and perfect for anyone with Celiac Disease or suffering from a wheat allergy. Although I should warn you right now. This is not the last of cookie recipes you will be seeing here before Christmas! There are a few more up my sleeve (or should in my freezer) that are all healthier versions of traditional cookie recipes. Um, I bake when I am stressed. Two kids home from school sick and the holidays will do that to a person… wink, wink. While the boys and I were making these cookies, Chase asks (at every baking session), “Can I eat it yet, is there egg in it?” Because what is more exciting when baking than finger-lickin’ the spatula!?! Vegan gluten free sugar cookies are perfect for anyone looking to lower wheat intake or have Celiac Disease. I purposely photographed these cookies plain. No icing or fancy-smancy stuff on top. Their crisp texture makes them delicious as a mid afternoon snack or dessert with tea or coffee. Tea or a latte enhances the luscious flavors of these crispy baked goods! Dip half in melted chocolate and sprinkle with pyramid salt. Turn the cookie wafers into peanut butter sandwiches! Mix peanut butter with a drop of honey and spread in-between two cookies. Add caramel in the center of two cookies then dip in melted white or milk chocolate. It is a chocolate covered caramel cookie! How yummy do all those versions sound! When I first tried this recipe I had to turn the dough into truffles because it was a bit tough for rolling out flat. By decreasing the amount of tapioca flour it became the perfect dough for cut out sugar cookies. All of the ingredients are 100% NATURAAALLLL! Maple syrup, gluten free flour, tapioca flour, baking powder, Himalayan salt, coconut oil and vanilla – 7 simple all natural ingredients! Gluten free sugar cookies are super healthy too! There is even a buttery flavor that is going on actually from the combo of coconut oil and vanilla combined. Coconut oil is fantastic for boosting the metabolism and the body processes it better than dairy fats (like butter). No, that does not mean one should eat the whole batch of cookies, but it does mean you can enjoy a few without the guilt! Extra crispy vegan & gluten free sugar cookies made with warm coconut oil and baked to crunchy perfection! 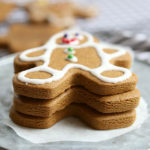 Turn this easy cookie recipe into cut outs, decorate with royal icing, dip in chocolate or serve plain! Preheat the oven 350 degrees F. Line a baking sheet with a silicone mat or parchment paper. In a mixing bowl add the maple syrup , vanilla and melted coconut oil. Quickly add the gluten-free flour, tapioca flour, baking powder and salt and mix until it forms a dough. If the dough is too sticky, set it in the refrigerator for 15 minutes before rolling it out. Roll out the dough in between two pieces of wax paper until the dough is about 1/4 inch thick. Cut out into desired shapes. Place on the prepared baking sheet and bake for 8-10 minutes. Let cool for 3 minutes before transferring to a cooling rack.